Antimicrobial resistance and drug resistant infections are major public health issues which are already complicating treatment for many patients and posing significant threats to the future of healthcare. To address this growing global problem we must ensure that we ‘take good care’ of our available antibiotics through good antimicrobial stewardship. 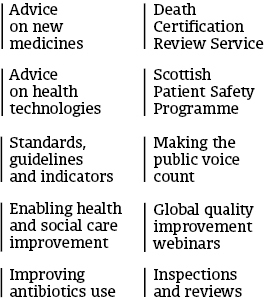 Healthcare Improvement Scotland has a key role to play in establishing strong antimicrobial stewardship through the Scottish Antimicrobial Prescribing Group (SAPG). Established in 2008, SAPG works in collaboration with regional board Antimicrobial Management Teams (AMTs) and clinicians from a range of specialties across hospital and community settings. Together, we have made great progress in improving use of antibiotics and promoting optimal safe care of patients with infection. About 80% of antibiotics are used in the community and the commonest reason for an antibiotic prescription is for a suspected respiratory tract (throat, ear or chest) infection. Many such infections are caused by viruses or are otherwise self-limiting so do not require antibiotic therapy. We continue to work with and support primary care teams in the recognition and management of those situations where symptomatic measures should be promoted over an antibiotic prescription. In 2016, 29.0% of the population received at least one antibiotic prescription in primary care which was the lowest proportion since data became available in 2010. SAPG’s work isn’t just about reducing antibiotic prescribing, it’s about improving prescribing to ensure better outcomes for patients and to minimise harm to individuals and wider society. A key measure of quality prescribing is choice of antibiotic following recommendations in local guidelines. In 2016, first line recommended antibiotics – the initial recommended treatment – accounted for 81.5% of antibiotic use in primary care, suggesting GPs and other prescribers are following local guidelines. In hospitals, improved use of antibiotics has had a significant and sustained impact on reducing Clostridium difficile in our most vulnerable patients. We have also been successful in introducing good practice recommendations for some of our most challenging infections and establishing safety monitoring processes for our most complex antibiotics. It is important that patients and the public are supported in their understanding of the difference between when an antibiotic is needed and when and how they should practice self-care. We take part in European Antibiotic Awareness Day (EAAD) every November to raise professional and public awareness of the problem of antimicrobial resistance/drug resistant infections and what everyone can do to use antibiotics more wisely. We also support the Antibiotic Guardian campaign developed by Public Health England, which encourages everyone to make a pledge about how they can personally help to make better use of antibiotics. To date over 2600 people (mainly healthcare workers) across Scotland have become Antibiotic Guardians. We aim to increase public participation in this programme through posters and leaflets in community pharmacies during EAAD. We also promote community pharmacies as the ‘first port of call’ for anyone with symptoms of infection for advice on symptom relief and whether they need to consult their GP. Our current and future work is closely aligned with the Chief Medical Officer’s vision of Realising Realistic Medicine, the aim being to reduce harm, waste and variation in antibiotic prescribing practice and to develop individualised treatment for patients wherever possible. This includes clinical decision support tools available at the point of care to inform individual patient treatment decisions, national antimicrobial Quality Indicators and metrics to drive improvement in prescribing practice and Penicillin allergy review to develop a simple, easy to use algorithm within hospitals to support de-labelling of patients without a true allergy. One success we have had in this area is with our Antimicrobial Companion app, which gives practitioners quick and easy access to clinical guidance and supports decision making on antibiotic prescribing. Registered as a medical device with the Medicines and Healthcare products Regulatory Agency (MHRA), the app was developed in partnership with NHS Education for Scotland (NES) and with the input of clinicians from hospital and primary care practices across Scotland. Although we have made progress, there is still much work to do to protect our population from antimicrobial resistance and drug resistant infections and to preserve our precious antibiotics for future generations. Our collaborative way of working, which has yielded these results, will continue to be central to everything we do. Dr Andrew Seaton is the chair of SAPG and Infectious Diseases Consultant/AMT Lead at NHS Greater Glasgow and Clyde.